Southern Sweet Potato Casserole: – Every year, as we inch closer to Thanksgiving, we think turkey…and all the trimmings. It also brings back vivid memories of Aunt Grace and her southern style cooking skills. Years ago, my “Aunt Grace” was a highly sought after caterer in the Willow Grove area of Philadelphia, Pennsylvania. Her cooking skills were sought after – especially her custom menus which often included Uncle Wen’s Fresh Lemon Pound Cake. Love southern style cooking? Recipes from Paul Deen to Southern Living! 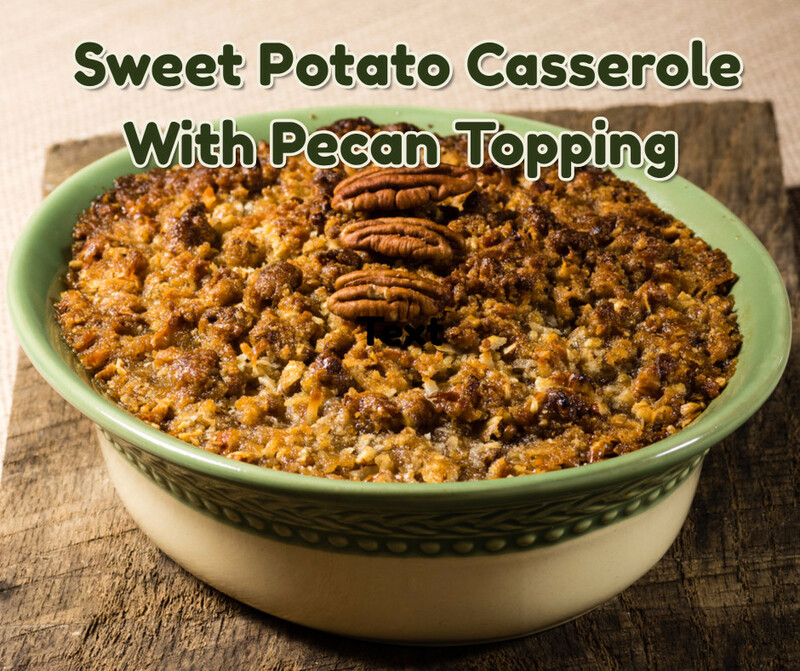 This sweet potato casserole dish was a staple on her catering menu during the holiday season. I always remember her catering preparations and, in particular, her recipes. Her kitchen was postage stamp size and even though she had the recipes written down, I do not recall her ever reaching for them as she assembled the ingredients. Not even to check! It was simply amazing to see how she magically assembled what she needed and then proceeded through the actual steps involved in preparing the entire recipe. At the time, it seemed logical to ask how many times she had prepared the Sweet Potato casserole. She would grin, give a low chuckle and then respond “Child, I’ve lost count”. When I was a few years older, I would also discover that, regardless of the dinner menu, her customers would always ask her “do you think you will have time to prepare the sweet potatoes?” – just in case she could slip in an extra dish on their menu. Give Grace’s casserole a try. You will not be disappointed. It is definitely southern style cooking because that’s where she was born and raised. She prepared it with an elegantly trimmed ham but there is nothing saying you can’t add this casserole to a turkey dinner. With ham on the side like we do! If you are counting calories, look away. But by all means, eat. 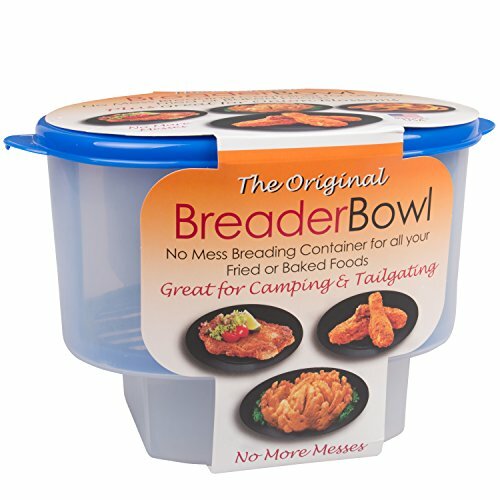 Here’s the perfect “what can I bring” side dish for Thanksgiving dinner which always rated a four star review with the customers. 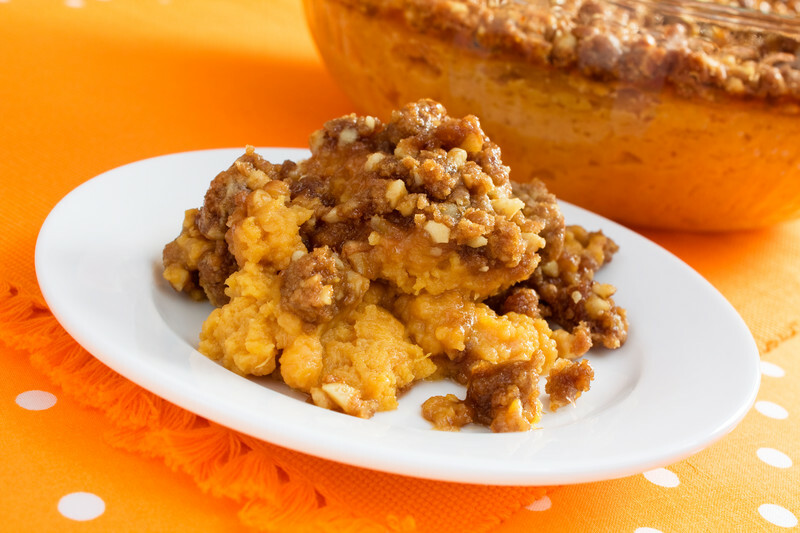 Southern Style Sweet Potato casserole was a favorite on the catering menu during the Holiday season. Mix all above ingredients together. Pour into a buttered baking dish. Melt the butter, stir in the brown sugar, add self rising flour then pecans. Mix until crumbly. Sprinkle over the sweet potatoes. My honest opinion? I would serve the sweet potato casserole for dessert with a side dish of Apple Caramel Crisp Pizza! Do you prefer a fresh turkey or a frozen bird? Don’t forget to check the recipe for our favorite molded cranberry relish! Previous Post Recipe French Bread Stuffing: Secrets To The Best Stale Bread Next Post Semi Homemade Birthday Cake: Best Chocolate Bundt Surprise!